A traditional hand tied wedding bouquet takes a certain amount of professional design skill. The flowers have to be rotated and turned like a spiral bouquet while placing the stems at a certain angle across the handle. I've created the beautiful look of a hand tie while guaranteeing a longer life because it has a water source. Designing is also much easier to create by using a new European Bouquet Holder because the flowers stay exactly in the right space. This European wedding bouquet holder is one of the newer products out by Oasis. 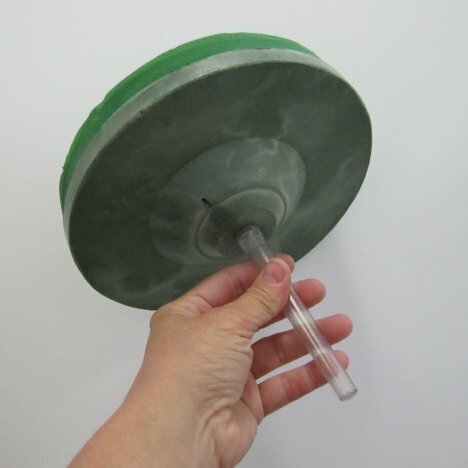 It holds a large round layer of MaxLife florist foam to give the flowers water. It measures 7" tall and 7 1/2" wide. The clear handle makes it great for using in the tall clear glass vases for reception centerpieces. 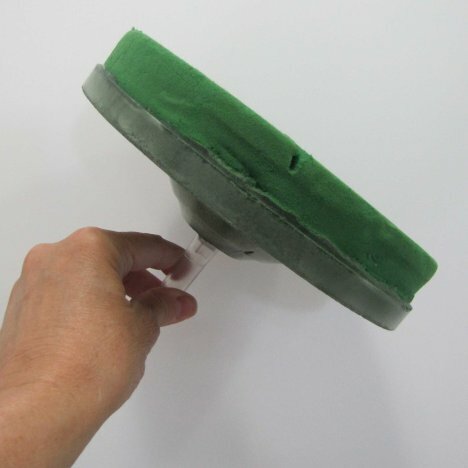 Don't be concerned if the florist foam shows a mark or two. This doesn't affect the performance and is a common occurrence during shipment or storage. This bouquet was created to be able to capture the look of European pave bouquets, but it is also perfect for larger traditional wedding bouquets that are becoming very popular again. You begin by soaking the wedding bouquet holder in water. 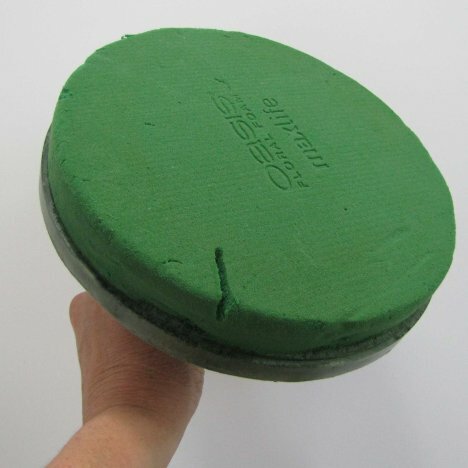 You should always let Oasis foam "float soak", meaning that you don't push it beneath the surface, instead let it float and draw the water into it. This holder will not sink like other bouquet holders, since the hard foam back keeps it afloat. 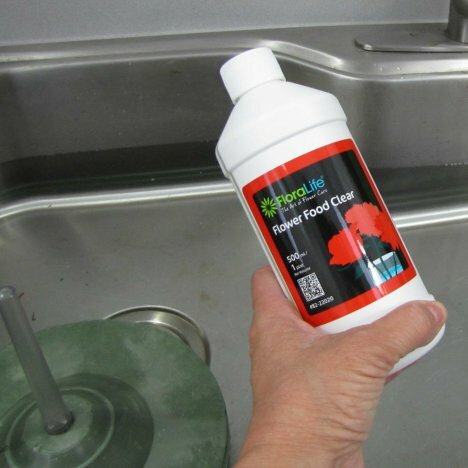 Always treat the water with a flower food before soaking the foam. This is a vital step that ensures your fresh flowers will be fed the proper nutrients, extending the bloom life of each flower. The foam becomes saturated very quickly. Just be sure to give it a full minute in order to eliminate any dry air pockets that could mean death to a stem or two of your wedding flowers. 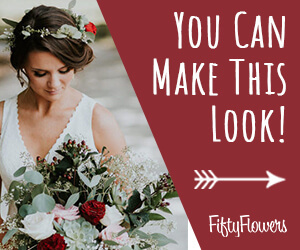 Your wedding roses should be already processed on the day you received them, but I'm going to go thru the quick steps to show you how bulk wedding flowers should be treated. Roses are packed 25 to a bunch. 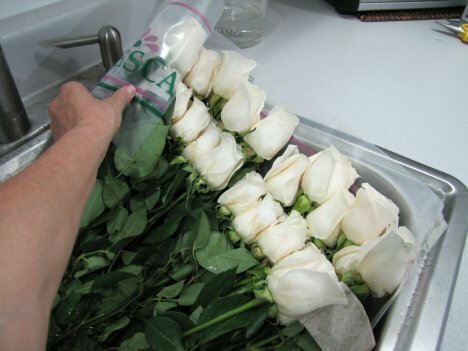 When cut at the farm, the roses are carefully wrapped in a way to protect the head of each rose. 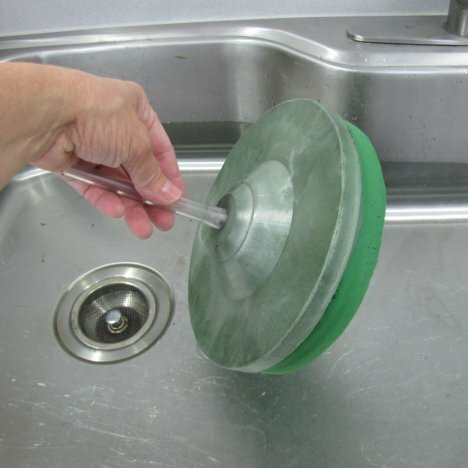 After filling a sink or water tub full of water treated with cut flower food, slit the outer packaging with scissors or a sharp knife. Be careful not to cut any of the roses at the same time. 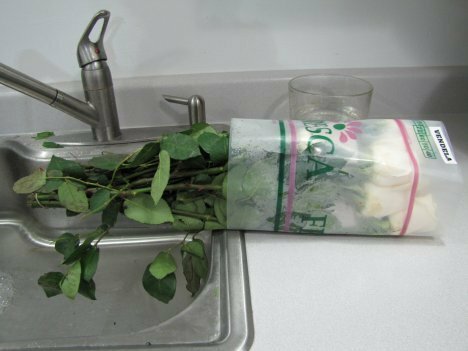 Gently unroll the package, revealing the roses. Often there is protective tissue between each head that must also be disentangled and removed. Don't be alarmed if you notice some light bruising or discoloration on the outer petals. These protective petals are left on deliberately to protect the inner rose head. You will remove those protective petals later when you begin to design your bouquet. 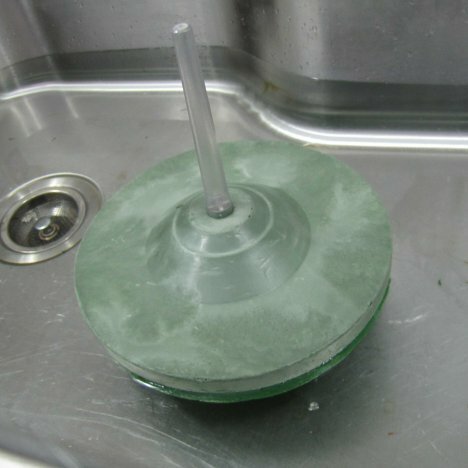 If you find a broken head, remove it, treat it with Quick Dip, and set it aside in a shallow glass of water. You can use any broken roses for corsages or boutonnieres. Remember - this is a live product, probably grown and cut in a field in South America. Professional florists expect an occasional broken flower or two during transport. They allow for this possibility and you should, too. No bulk flower provider is going to give you a guarantee that every flower will be picture perfect. Read the fine print. 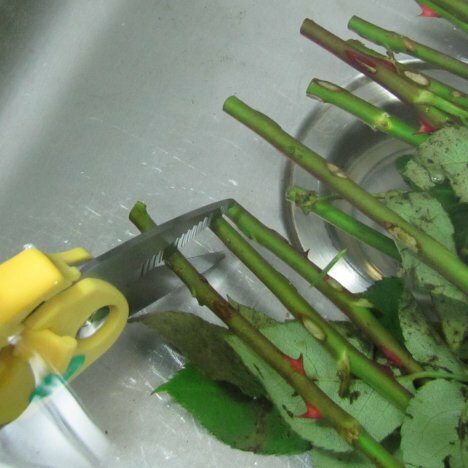 Be sure each stem of every rose is submerged under water before cutting. This ensures that the first "gulp" that the dry packed rose will take in will be water - NOT air. If you cut above the water and air is sucked into the stem, it can create an air bubble that will prevent water traveling up the step. That's why you sometimes see "bent necks" on a rose. The stem is healthy, but the rose head doesn't receive the water it needs to survive. Florist snips are great for cutting your bulk wedding flowers. Regular shears can crush delicate flower stems, making it difficult for the flower to take up water needed to stay fresh. 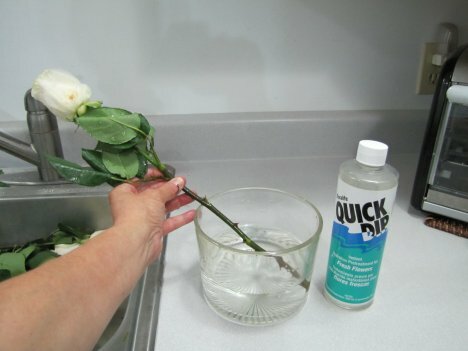 Immediately after cutting under water, dip the cut end of the rose into a waiting container of Quick Dip. This is a product that literally "wakes up" the flower that's been packed in dry stasis. It quickly takes vital water and nutrients in the water to help ensure a longer life of a rose.